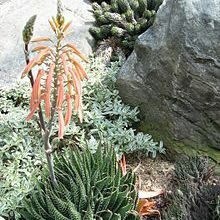 Tough plant known as the Lace Aloe from South Africa. Have grown this outside for years hardy to -7c but if kept in dry position will survive winter. Easy house plant. Orange flowers on racemes.